This tour always departs in the morning and there's no alternate time. We are comparing Vienna Woods and Mayerling Half Day Trip Prices from leading ticket suppliers and Try to find you Cheap tickets prices on the market. A half day tour from Vienna to Vienna Wood and the Mayerling hunting lodge. Vienna Woods are a forested highland area that sit in the states of Lower Austria and Vienna. They form the northeastern foothills of the Northern Limestone Alps. The wooded recreation area spreads 45km long and 30 km wide and offer a popular escape from the city. The woods have been populated since the 8th century and were principally used as a hunting ground for royalty. The woods are famous because royalty were found dead here in a hunting lodge. It's thought that Baroness Mary Vetsera was killed by her husband the Crown Prince Rudolf who then committed suicide. Seegrotte Lake sits inside the Vienna Woods and is the largest underground lake in Europe. 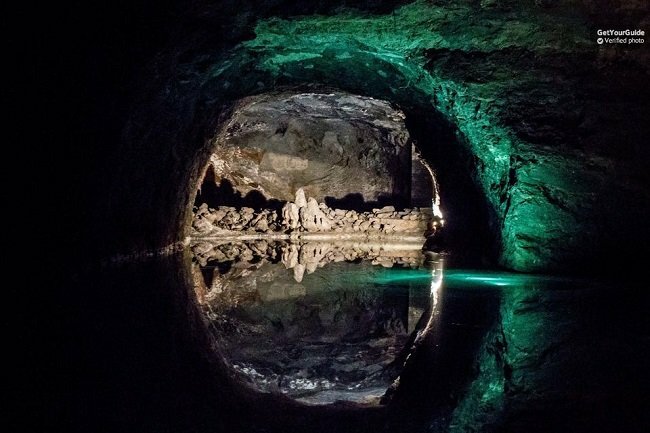 The underground cave was once a mine until 105 years ago a blasting operation flooded it with 20 million liters of water. The lake is 6,200 square meters and has a blue/ turquoise tint to it. Great for those looking for a recreational activity. Perfect for those wanting time out of the city. Your Experience With Vienna Woods and Mayerling Half Day Trip? Depart Vienna on a modern coach and take a scenic drive through the picturesque Helenental Valley. Escape the city and head to the forested Vienna Woods, located on the outskirts of the Vienna. Visit Mayerling town's historic hunting lodge and memorial chapel. Head to the Cistercian Heiligenkreuz Abbey and visit the medieval tomb of the last Babenberger. Enjoy a boat ride on Europe's largest underground lake and explore the underground cave system. Drive past the Roman city of Baden, which is famous for its hot springs. What Vienna Woods and Mayerling Half Day Trip Includes? Boat ride at the Seegrotte. Don't forget to check your departure location as they change during the winter and summer. Travelers Reviews about Vienna Woods and Mayerling Half Day Trip? The Vienna Woods and Mayerling Half-Day tour is rated 4.5 stars on Tripadvisor with customers calling it "a great escape from the city" that offerd "picturesque scenery". This guided tours is not accessible for wheelchair users. Tickets booked through Get Your Guide can be cancelled for a full refund 24 hours in advance. Tickets booked through Viator can be cancelled for a full refund 7 days in advance. Make sure you pack a day bag with snacks, water and money for meals or gratuities. Tours currently depart from Südtiroler Platz. From the 24th March 2018 onwards tours depart from Operngasse 8, next to the State Opera. 24, 48 or 72 hours.